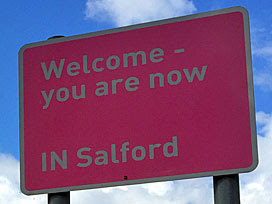 And then there's Salford, which definitely isn't part of Manchester proper. It's part of Greater Manchester, but that's different, Salford being an entirely separate place, attaining city status in 1926. The two are barely separated by the River Irwell, although it's for the old docks on the Manchester Ship Canal that Salford is now best known. After the decline of the third biggest port in Britain, which isn't bad for 40 miles inland, Salford City Council spent the 1980s intensively regenerating its quayside. They wiped away the cranes and gantries, dammed off the polluted waters, added roads and bridges, knocked up a whole new set of buildings and created a whole new urban landscape called Salford Quays. The original buildings look terribly dated these days, all low density lowrise surrounded by car park, and it's ever so easy to imagine Michael Heseltine turning up in a hard hat to oversee construction, then returning in a suit to open everything. 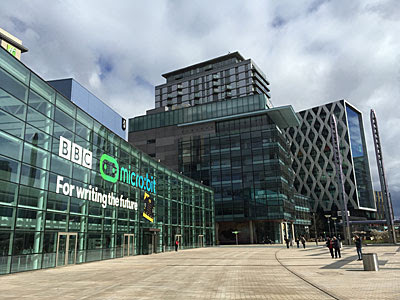 A second burst of life has occurred over the last decade, kickstarted by the BBC's decision to move lots of its production out of London, and other media organisations have followed to create a proper entertainment cluster. The first landmark building to be erected was The Lowry, a theatre/gallery complex on a tip of land at Pier 8. It looks classically alien from the front, like a collection of bold geometric shapes, and rather shinier and more steely from across the water. Inside The Lowry are two theatres and plenty of gallery space, including a unique collection of matchstalk paintings by its artist namesake... or so I'm told. I've walked past twice, once in 2003 and once at the weekend, and never quite felt sufficiently welcomed to push open the door and step inside. I walked up to the front this time and tried to work out if it was OK to go in and look at the pictures, there being no obvious signs, because all I could see from the outside was a box office and a dead-looking cafe, but seemingly best not. So I went in the shopping centre instead. The Lowry Outlet Mall is what drives the majority of non-working traffic to Salford Quays, because nothing beats wandering round double decker arcades lined by cavernous shops selling stuff slightly cheaper than you can no longer buy elsewhere. I didn't stay long. Across the dock, past Nando's, is the rather more recent MediaCityUK. A splayed out crescent of glass towers curves round a paved piazza, not quite as excitingly as you might hope, thanks in part to the twin towers of a Holiday Inn rising behind. Stickers on the windows hint at what's made inside, with CBBC and Mastermind in the building by the bridge, BBC Breakfast and Match of the Day on the other side, and BBC 6Music broadcasting further back. The BBC must have entered its "We'd better not spend too much" phase when this was built, because its constituent blocks are capacious without ever quite being interesting, and the overarching effect left me cold. What's also missing is the opportunity to properly interact and go inside unless you've pre-booked on a tour, and a selfie opportunity with a fibreglass Pudsey doesn't quite cut it. Thank goodness then for the Blue Peter Garden, northern version. This is located by the tramstop, and is fully open and accessible to the public, which shows a major level of trust given the overnight trashing its southern counterpart once endured. I was delighted to see that the Italian Sunken Garden still exists, if a covered rectangular pond surrounded by pots and paving counts, beautifully maintained with bright blooms and numerous representations of the Blue Peter ship. I was also reassured to see the original 1978 concrete footprints of Percy, Lesley, Simon, Shep and Goldie have been transferred to Salford, now augmented by similar indentations made by the show's current crew (precisely one year before my visit). And yes, Petra's statue watches over the lot, just as she did at Television Centre, except here anyone can pay homage. Across the Media City footbridge, officially crossing from Salford into Trafford, sits the most peculiar building of the lot. It's the Imperial War Museum (North), a juxtaposition of three elemental 'shards' by Daniel Libeskind, and opened in 2002. The visitor experience is deliberately disorienting, and right-angle-free, entering through a minor doorway then bending back up the stairs to reach the main internal exhibition space. The museum focuses on first hand experiences of war, so isn't bursting over with artefacts to view, but tells the story of a century of war in sufficient grim detail around the irregular perimeter. Every hour the lighting dims and an immersive audio-visual experience is projected across the upper walls - I got memories of the Home Front, you might get a Baghdad air raid. And whereas last time I visited it was also possible to take the lift up the Air Shard for a grandstand panorama, alas the entrance to this windswept viewpoint appeared to be very boarded up, as if they don't like to talk about it any more. If you've ever wondered where ITV's flagship soap opera is filmed, the answer is on a backlot at Salford Quays. Specifically it's by the Ship Canal adjacent to the IWM, and immediately opposite the BBC's main building, and would be really quite public had the studios not been surrounded by a giant wall. The cobbles are well back from the water, behind a second screening wall, and the outer bailey has two giant metal street signs on it in an attempt to make potential visitors think they've actually seen something. Don't come expecting to see anything. ITV's studios haven't been here at Trafford Wharf for long, with first filming in 2013 and a first appearance on screen in 2014. Previously they were in town, that's Manchester, coincidentally on Quay Street. Granada opened studios on former railway sidings at the start of its franchise in 1956, but it wasn't until 1968 that Coronation Street filming emerged from indoor studios to a specially constructed set on the backlot. Tours of a further-upgraded street were available for several years, except on Mondays when the cobbles between the Rovers and the Kabin were used for filming, and restarted in 2014 after the production team moved to Trafford. Unfortunately the Granada Studio Tour finished for good at the end of last year, so that the old set can be demolished and the land reused for much more profitable redevelopment. Some of the old studios are being retained for media, events and retail, but there'll be no tiny terraced houses on the refreshed site owned by harridans in hairnets, and nothing more than a small plaque in memoriam. The original 1960 set was inspired by Archie Street in Ordsall, as seen in the opening credits for years, and which was bulldozed in 1971 so don't go looking. But there is a genuine Coronation Street a short distance away, on the northern edge of Ordsall, by chance approximately halfway between the soap's old and new filming locations. A few of the original streets around Regent Square survive, of which Coronation Street is one, with its one long terrace and some green metal railings in lieu of a front garden. The handful of streets opposite meet at fenced-off back alleys, or blossoming greenspace, while pigeons peck at the tarmac and the occasional postie goes by. It looks almost gentrified, were this Hackney, but this is no rich neighbourhood, as the extremely famous building at the end of the street affirms. For this Coronation Street is also the location of the Salford Lads Club immortalised by The Smiths on the inner sleeve of The Queen Is Dead, in all its redbrick glory, and still doing sterling recreational work keeping local youth off the street. A man several decades past being a lad was out front smoking when I passed, making it difficult for me to pose moodily outside, but if I'd realised the building is open to visitors on Saturdays (from 11am to 1.30pm) I could have eagerly explored inside.